Given Scandinavia’s long, dark winters, it’s not surprising that the arrival of summer is a big deal throughout the Nordic countries. In Sweden, Midsummer’s Eve is one of the most important days of the year, rivaling Christmas with its festive spirit and traditions. Traditionally, Midsummer was celebrated on June 24, the feast day of St. John the Baptist, but the holiday has its roots in a pre-Christian solstice festival. Rather than trying to stamp out such pagan festivals, the early Catholic Church found it useful to coopt them by associating them with Christian celebrations. By establishing December 25 conveniently close to the winter solstice as the date when Jesus was born, the Church was able to absorb the pagan midwinter festival of Yule into the Christian celebration of Christmas. Biblical sources suggest that St. John the Baptist was born six months before Jesus, meaning that his birthday could be equally conveniently associated with pagan summer festivals. In 1952 the Swedish Parliament decided that Midsummer should always be celebrated on a weekend. This took effect the following year, and as a result, the observance of Midsummer now varies between June 20 and 26. 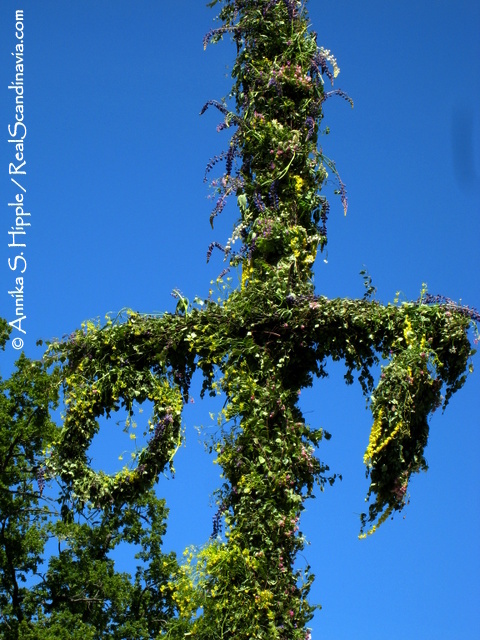 Though the tradition of decorating the maypole with leaves seems to be a Germanic addition, the origins of the maypole itself date back to early medieval festivals in France, when the Carolingian kings would muster their troops on May 1. Among other contests archers would compete in shooting at a bird (real or fake) placed at the top of a tall pole. These so-called parrot-shooting contests became very popular throughout Europe. Reflecting this history, some maypoles are still decorated with a rooster or other bird at the top. 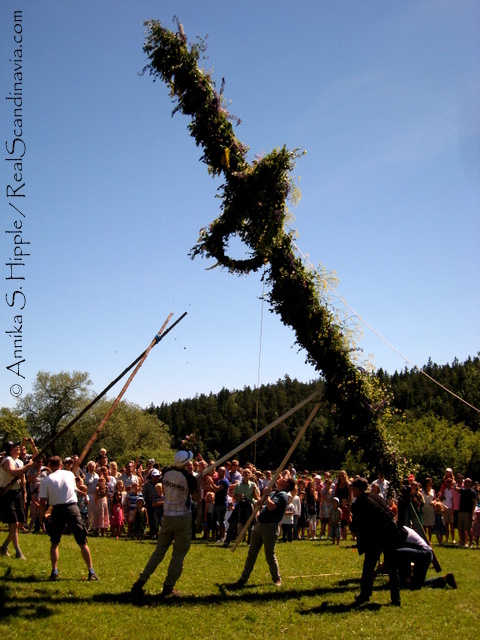 The tradition of dancing around the Midsummer pole is an old one, though of course the dances have changed over the centuries. 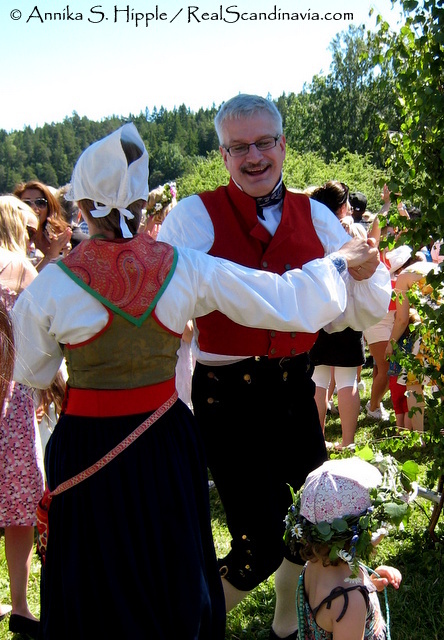 Today organized Swedish Midsummer festivals typically include exhibitions of folk dancing in traditional costumes, as well as ring dances and games for people of all ages to join in. 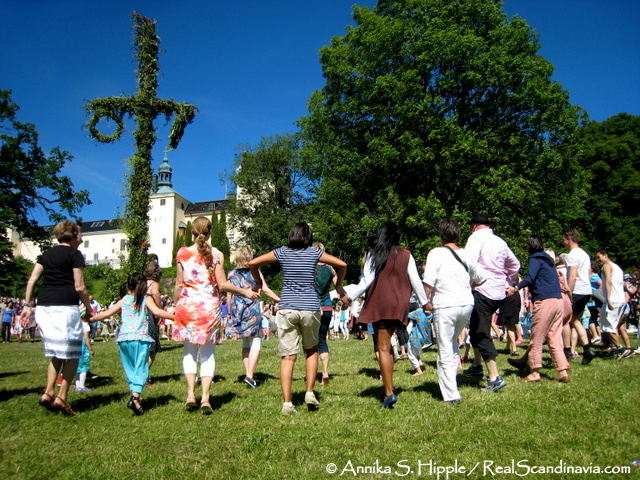 No Midsummer celebration is complete without Små grodorna, a dancing game in which people of all ages hop around the pole while singing about little frogs. The goofiness is part of the fun! Midsummer was considered to be a time of magic, and anything to do with nature was thought to have a special power. Gathering flowers to weave into wreaths and crowns was a way to harness nature’s magic to ensure good health throughout the year. 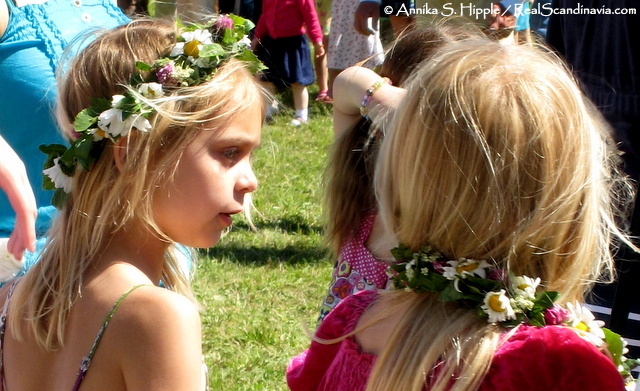 Even though most people these days probably are unaware of the magical origins of the tradition, weaving crowns of flowers is still a major part of any Midsummer observance. The magic of Midsummer also extends to the realm of romance. A Swedish verse says, “Midsummer night is not long but it sets many cradles to rock.” For unmarried girls, it’s said that if you pick seven (or sometimes nine) types of flowers and place them under your pillow, you’ll dream of your future husband. And if all of this makes you hungry, then sit yourself down for a Midsummer meal of herring and new potatoes, a shot of schnapps, and some strawberries for dessert. Wish I had known about this festival before booking my flight and accommodation to spend a month in Sweden this summer! I actually stumbled across it by accident when planning to do a blog post on Swedish National Day as a sort of “preview” to my trip. That’s when I discovered that Mid Summer’s Eve was more important to Swedes than their national day. Oh, well … if only I had known. There are so many things to consider when planning a trip. I was under pressure to pick dates quickly because of a special promotion with limited seats and available dates and time was running out. There’s always next year! 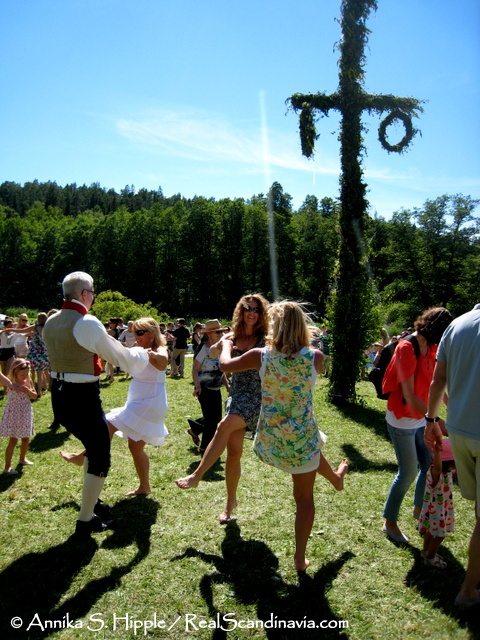 How lucky you were to trip into the wonderful Swedish Midsummer celebrations. In Stockholm during the festival. But no one seems to be able to explain where the festivals are. We have asked repeatedly and get vague answers. Searching the internet does not seem to help either. Look at all the local parks – that is where most of the authentic celebrations are held. We attended one last year about an hour north of Stockholm. The south of Sweden has the celebrations in almost every corner. I am so bummed. I live in the US but it is important to me to observe my Swedish roots. I have a family obligation (wedding of all the inconvenient things) on the day that I had my midsommar party planned. Can I celebrate it the following weekend? Do Swedes extend their celebrations? In Sweden, Midsummer celebrations are held at Midsummer and not at other times. 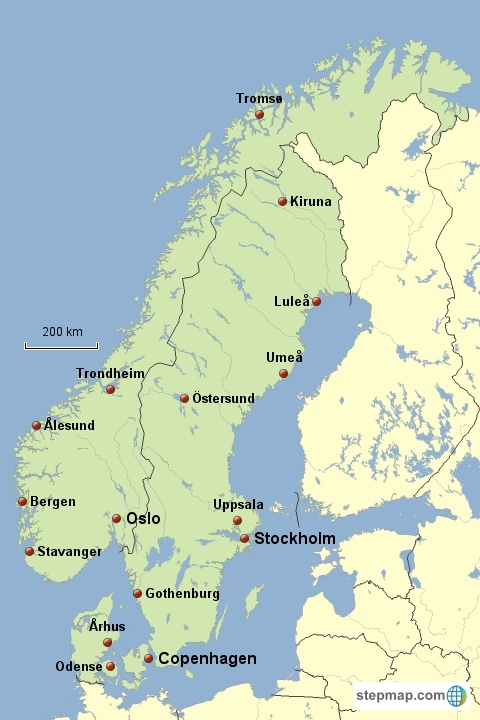 But in the US, I’ve been to Midsummer celebrations hosted by Scandinavian heritage groups both the weekend before and the weekend after Midsummer. If you’re having your own party, especially if it’s in the US, then do what works for you and don’t worry about it. Have fun! No Sweden does not extend the Midsummer holyday. Does anybody extend Christmas? Midsummer is as important as Christmas for a Swede.